From early Christianity, Western society inherited a powerful and conscious tradition of religious intolerance. Christian commitment was exclusivistic. It proclaimed itself to be the only true faith, and regarded itself as eligible for the universal allegiance of all mankind. It was a voluntaristic faith, and to the end of converting and embracing the whole of humanity it was from the outset committed to relentless proselytising. This unique constellation of attributes differentiated early Christianity from other contemporaneous religious movements; from Judaism, which was ethnically based, and from the prevalent mystery and emperor cults which were tolerant of, or at least indifferent towards other religions. Medieval Christianity maintained its aggressive proselytising against pagan and heathen religion, the votaries of which were to be converted, but developed an even more rigorous policy of suppression of all wayward or heretical manifestations of Christian belief. Heresy was punishable by death — a policy theologically justified by Thomas Aquinas (1225-74) and relentlessly implemented by the Inquisition (instituted in 1232 and finally suppressed, in Spain, only in 1820). The Reformation brought some, albeit gradual, diminution of the grosser forms of religious intolerance, but hostility towards “deviant” expressions of Christianity persisted even in the most liberal and advanced of Protestant countries. When, after the Reformation, divergent forms of Christian belief acquired a body of stable adherents, and emerged as new religious movements, they almost always encountered extreme intolerance. The Hutterites, initially originating in the Tyrol, were recurrently put to the sword, and forced in stages to flee from one settlement to another across central Europe. The Quakers in England suffered persistent harassment in the late 17th century, and many of them were imprisoned for their beliefs. The early Methodists in the 18th century were frequently mobbed and some of their chapels burned. Local law officers and magistrates were not infrequently party to such persecution, stimulating mob action, and regarding these law-abiding religionists as culprits rather than as victims. In late 19th century England, the early adherents of the Salvation Army suffered similar hostility. In one year alone over 600 of its “soldiers” were assaulted by “roughs” whom Salvationists believed were encouraged by the influential brewing industry. On the other hand, in the course of a few years a similar number of Salvation Army personnel were imprisoned on such dubious and perhaps trumped-up charges as obstructing the highway. In Switzerland in the 1890s they were indicted for deception and financial exploitation, charges similar to those which had been brought against Mormon missionaries in Scandinavia earlier in the century. Early in the 20th century opposition to some new religions was expressed in different forms: Christian Science was bitterly denounced both for its claims to spiritual healing and its denial of the reality of matter, but the condemnation was largely literary, ranging from the satire of Mark Twain to the serious onslaught of the distinguished historian, H.A.L. Fisher, among a veritable library of hostile commentaries from clergymen, medical practitioners, and, in lighter vein, a genre of lampoons, cartoons, and satirical novels. Opposition to Jehovah’s Witnesses, still seen as a new movement in the first half of the 20th century, was often more physically expressed. They suffered crowd violence in the United States in the Second World War, and some were tarred and feathered. They were persecuted for refusing to salute the flag and to sing the national anthem not only in the United States but in countries as different as Malawi, and their conscientious objection to military service brought them legal prosecution in France, Spain and Greece even in recent decades. In Quebec, this generally law-abiding sect was relentlessly pursued by government law officers throughout the 1940s and 50s on a wide variety of supposed infringements of the law. The examples could be multiplied — they serve to illustrate the continuing incidence of religious intolerance and the recurrent opposition to newly emerging religious organizations and new conceptions of religious practice. What all of these instances have in common is that these victimized sects were all, in their day, relatively new minority religious movements. Because they deigned to dissent from one or another prescription of the established religion, or chose to entertain their own conceptions of deity, salvation and worship, or because they challenged the norms of contemporary secular society, they became objects of distrust, and were regarded as agents of social disruption. With the passage of time, once-new religious movements tend to attain greater social acceptability. The sects and movements that were new a century or more ago — Seventhday Adventists, Mormons, Jehovah’s Witnesses, and others, became familiar and more or less tolerated. Whilst still often the victims of social opprobrium, they have been increasingly allowed to function in their own way. But discrimination and opposition persists, focusing, as before, on newly emerging religious organizations. In the last five decades, the number of new religions in Western society has increased dramatically. Some are derived from variants of the major oriental faiths; others have emerged from eclectic reappraisals of elements in various religious traditions. Yet others have drawn on indigenous folk religion, or claim to be modern reformulations of ancient paganism. Still others appear as spiritual responses to the advances in natural science, communications technology, and various forms of mental therapy. Many seek to awaken and release human potential and to cultivate a spiritual dimension for the increasingly secular experience of man in modern society. Scholars in this field unanimously emphasize the diversity of these new movements, most of which have in common only the contemporaneity of their emergence. Yet, what is apparent is a tendency, evident in the media and in the utterances on this subject of public figures, for all new religious movements to be lumped together as if they conformed to one particular stereotype. That this disposition is in itself inimical to the fair treatment of new religions must be apparent. When — rightly or wrongly — one movement is openly accused of actions or attitudes contrary to the public good, the allegation tends easily to be transferred to all such movements, concerning the specific stance and activities of each of which the public at large is not well-informed. Since these movements are little known, misunderstanding, rumour, myth, and calumny easily accrete around their reputations. Because of the way in which the media themselves operate, an allegation, once made, tends to be reiterated as journalists, who often rely on earlier media reports, whether authenticated or not, repeat a familiar story-line and so produce what sociologists have termed “negative summary events”. A small number of dramatic and altogether atypical episodes have exacerbated the creation of hostile responses to new religions. Whether the Charles Manson family, which perpetrated gruesome murders in California, or the Symbionese Liberation Army, which engaged in terrorist activities, were in any proper sense religious movements, is disputable, but the media readily described them as such. Jim Jones, central figure in the Jonestown tragedy in Guyana in 1978, was a religious minister — but of an established denomination, the Disciples of Christ, not of a new religious movement. The Waco massacre in 1993, the Solar Temple episode in Canada and Switzerland in 1994 and the lethal activities in Japan of Aum Shinrikyo in 1995, were pathological phenomena pertaining to new religions — but to particular movements, not to new religions in general. Such events are mercifully rare, and must be seen in perspective: given the literally thousands of new religions operating in advanced industrial societies (Western countries and Japan) bizarre episodes of this kind may be regarded as highly exceptional. Yet, because these tragedies have deeply scarred the public mind and — not always with complete justification — because they have been attributed to new religious organizations, the image of all such movements has tended to become unwarrantably tarnished. Yet, the fact is that most new religious bodies function as innocuous agencies of moral, social, and spiritual support for their adherents, entirely remote from the perceptions that have been perpetrated in the moral panic that has been aroused about new religious groups. In addition to the hostility stimulated by the mere fact that a religion is “new” (in societies where the predominant general assumption is that religion is necessarily “old”) the variety of contemporary new religions is such that each of them may be attacked for some feature specific to itself. Such charges may diverge to the point of sheer inconsistency. Thus, whereas some new religions, which encourage their members to involve themselves in mainstream everyday life activities, attract criticism because they are said to seem “to infiltrate” major social institutions and businesses, other groups, which practice communitarianism, are condemned for their separate community lifestyle and for taking people out of mainstream society. Some are berated for their hedonistic orientations, and their permissive attitudes to sexuality and drug use; others receive no less hostile condemnation for inducing young people to sustain a highly ascetic way of life. In an age when a wide variety of social forces stimulate the break-up of the modern family, it is new religions which are often singled out to face the charge that they “break up families”. Such charges are perennially levelled against new movements with perhaps no more justification than was the case when similar indictments were made against monastic movements in past centuries. A variety of diverse concerns appear to have stimulated opposition to Scientology, including those usually aroused in relation to new religions in general. First, Scientology may arouse suspicion because it claims to derive spiritual insights from the application of rational procedures. Those committed to traditional religion generally regard religious values as altogether transcending the realm of the rational, and may be affronted by the idea that religious truths or spiritual benefits can be realized by technical means — means others than their own hallowed conceptions of worship and morality. Rational procedures and systematic learning characterize science, technology, and economics rather than the quest for ancient religious truth or spiritual experience. Because Scientology conjoins spiritual goals and rational, technical (and indeed technological) means, those committed to established religion tend to condemn it as not “real” religion. They regard it as spurious because it utilizes modern knowledge rather than ancient formulae, minimizes or relinquishes such usual religious concepts as sacrality and ritual, and adopts a pragmatic orientation to the pursuit of religious goals. Ignoring the extent to which religious giving and endowment are necessary to all religious organizations, they also see that in Scientology, adherents are required to pay towards the cost of their instruction as too commercial and business-like, too directly a matter of payment for services, to be appropriate for a religion. Hence, the economic arrangements of Scientology are represented as exploitative and therefore disqualifying that movement as a religion. However, those advancing such strictures fail to recognize that in established churches imperative financial demands are inevitably made on adherents, as in the payment for a mass in the Catholic Church, in the instituted covenants of some Protestant denominations, or in tithes exacted, in the past, by the major churches, and still required in numerous Christian sects. These financial levies appear to be of a different kind only because the payment procedures are sanctified by often ancient custom or sanctioned by Biblical warrant. Critics of the economic arrangements of the Church of Scientology ignore the fundamental functional similarity of the economic procedures of traditional religions simply because the form differs and in virtue of the antiquity and sanctity in which they are usually clothed. Second, Scientology promises therapeutic benefit in releasing individuals from the effect of past traumatic experiences. That promise may appear to conventional practitioners of psychiatric medicine to be a challenge both to the theoretical assumptions of their practice and, more especially, to the techniques they employ. Thus, two groups of professionals, clerics and psychiatrists, who may be said to have vested interests in these matters, are likely to stimulate opposition to Scientology, and each has a wider constituency of fellow professionals (teachers and physicians for example) and of a still wider lay public whom they can influence. Third, some of those who take up Scientology decide to undergo further training to become qualified Scientology auditors, abandoning more conventional career opportunities. Parents, relatives, and friends uninitiated in Scientology may view such a decision with alarm. If estrangement from family and friends follows such a religious choice, as has sometimes been the case, this provides further ammunition for those who oppose this new religion — it becomes, in their eyes “a cult which breaks up families”. Fourth, a more general and diffuse aspect of the cultural ethic of Scientology may stimulate further opposition. Traditional Christianity inherits a broadly ascetic orientation to the world, and has cultivated, well beyond the confines of the churches or their congregations, assumptions about the essential character of true religion, namely that religion should be solemn, fostering an ascetic ethic, and committed to the sacrifice of this-worldly comforts in the interest of preparing for reward in an afterlife. Its preoccupation has been to imbue man with a sense of his inherent sinfulness and his inability by his own efforts to attain salvation. Instead, people were enjoined to depend only on a saviour-god. The Church of Scientology, in contrast, maintains that spiritual benefits may be realised in present life. It contends that all individuals are inherently good, and teaches that everyone should take responsibility for his own life and activities. For the churches, a religion which rejects the inherent sinfulness of mankind is already an affront, but this challenge is not lessened by the fact that the ethic which Scientology embraces has much closer affinity with the ethos prevailing in the secular Western world of the late 20th century, an ethos of permissive hedonism, emphasizing human happiness and encouragement for people to realize their full potential. Even many non-religious people, who accept a secular hedonistic orientation to the world, are unready to acknowledge as religion a doctrine which abandons the solemn condemnation of all mankind as sinners, and, little as they may consciously accept the traditional Christian position, nonetheless oppose a religion which in these fundamental matters differs from it. Thus, because some are not yet ready to relinquish the traditional world view, and because others believe that, although they do not endorse that ethic themselves, nevertheless, it is business of religion to do so, very different sections of the general public are drawn together in opposition to the new religion of Scientology. It is a general characteristic of established religions to emphasize their antiquity. This claim is intimately associated with the belief that there are abiding truths, eternal verities, and the vague but powerful idea that authentic wisdom comes from some unspecified primordial past. At the same time, there is a widespread awareness of the relentlessness in many aspects of social life of irrevocable change. 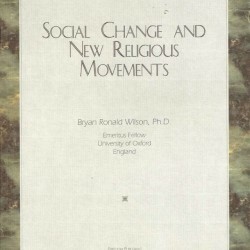 When the economic and industrial order is undergoing such rapid and perceptible change, when social structure is manifesting a constant process of re-adaptation, when major social institutions — the polity, the law, education, recreation, and even the family — are all experiencing both constant unconscious adjustment and programmes of conscious reform, it would be extraordinary were religious ideas and organizations not to be undergoing similar processes of change and innovation. This they do, the premium on antiquity and tradition notwithstanding. Yet, so embedded is the assumption that religion should be, as liturgy puts it, “as it was in the beginning, is now, and forever more shall be” that the agents of other social institutions find it difficult to come to terms with the idea of new religions or the innovative procedures which those religions promote. Law officers work with out-worn definitions, established by case law extending into the remote past, so that even the legal conception of what might constitute religion is confused and obsolete. Politicians, sensitive to public disquiet when for any reason new religions are attacked in the mass media, readily invoke conventional and established assumptions about the nature of religion. Journalists play on these widely diffused traditional conceptions when, intermittently, religious issues can be elevated into matters of wider public concern. The religious establishment itself, despite endeavours to bring their own religious performances “up to date”, generally view with suspicion any innovative developments that occur outside the confines of the churches. In a rapidly changing world, in which social institutions are all in flux, to religion alone is ascribed a continuing and theoretically unchanging role, function, and form. Yet the evidence is that considerable numbers of people are seeking, and finding, new patterns of religious practice and new conceptions of religious truth, engaging in new spiritual quests, and participating in new types of religious organization. Although many of the major agents of public opinion and influence are still wedded to the ancient stereotype of religion, opposition to new religious movements largely because they are new is tantamount to resistance to the very process of social and religious evolution itself. 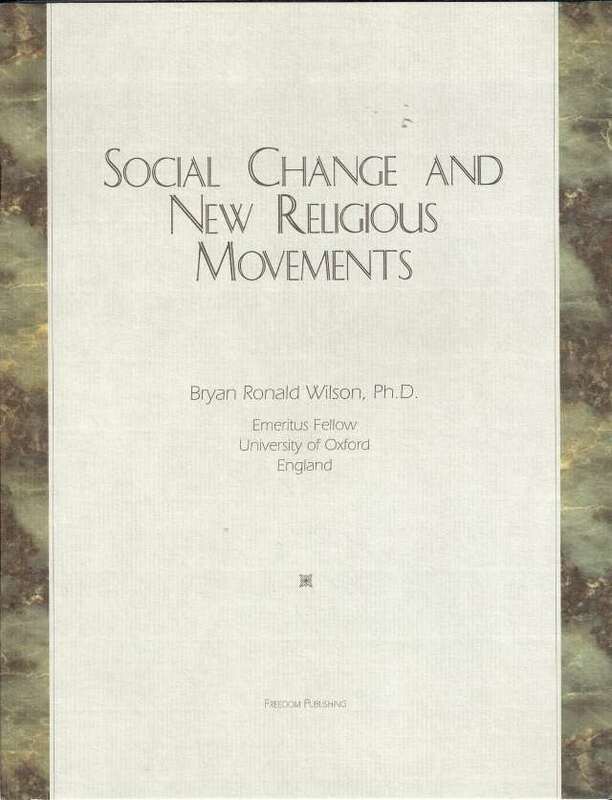 Bryan Ronald Wilson is the reader Emeritus in Sociology in the University of Oxford. From 1963 to 1993, he was also a Fellow of All Souls College, and in 1993 was elected an Emeritus Fellow. For more than forty years, he has conducted research into minority religious movements in Britain and overseas (in the United States, Ghana, Kenya, Belgium and Japan, among other places). His work has involved reading the publications of these movements and, wherever possible, associating with their members in their meetings, services and homes. It has also entailed sustained attention to, and critical appraisal of, the works of other scholars. He holds the degrees of B.Sc. (Econ) and Ph.D. of the University of London and the M.A. of the University of Oxford. In 1984, the University of Oxford recognized the value of his published work by conferring upon him the degree of D.Litt. In 1992, the Catholic University of Louvain, Belgium awarded him the degree of Doctor Honoris Causa. In 1994, he was elected a Fellow of the British Academy. For six years, Joint Editor of the Annual Review of the Social Science of Religion. He has lectured extensively on minority religious movements in Britain, Australia, Belgium, Canada, Japan, and the United States, and occasionally in Germany, Finland, France, the Netherlands, Norway and Sweden. A Time to Chant: the Soka Gakki Buddhists in Britain, [with K. Dobbelaere] Oxford: Clarendon Press, 1994 (Japanese translation in preparation). He has also contributed to more than twenty-five articles on minority religious movements, to edited works and learned journals in Britain, the United States, France, Belgium, the Netherlands, and Japan, and to the Encyclopedia Britannica, the Encyclopedia of Social Sciences, and the Encyclopedia of Religion, and is currently preparing a contribution for the Encyclopedia Italiana.